We have plenty of other gift ideas for dads in general, but here are two good gifts for divorced dads, probably from friends or family interested in supporting dads’ relationships with kids who may not even be in the same city. Both are also wonderful presents for dads who “can’t be there” whether due to business travel or military service. 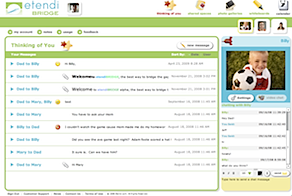 The first is the Vidtel telephone service. Vidtel is finally the telephone of the near future that AT&T promised to us at the 1964 Worlds Fair. Vidtel, using broadband (cable or DSL) connections, finally makes good on that promise. Because it’s broadband, rather than POTS (plain old telephone service), the picture quality and voice are as good as any online connection using Skype or one of the many online video chat services. The big difference though is that the connection is made using what looks to be a traditional telephone. This means that any child can answer the phone, and even dial from it, making connection possible without an adult to set the connection up. Vidtel is a bit expensive at $14.95 per month for each phone (other Vidtel payment plans available). At this price, it’s not for everyone, but in our tests, it does what it promises to do: makes it easy to make video calls, inlcuding video voicemail. For a divorced dad who doesn’t want to go through a ex-spouse gatekeeper for every conversation with his child, this might be a good solution. Additionally, the Vidtel has an auto-answer setting making it possible to be used as a room monitoring device. We’d counsel against using this for spying, but there are very real situations (new babysitter) where this might be handy. The ease of use of the Vidtel system also makes this a good choice for older grandparents who may not be able to use computer videoconferencing. The second is the etendi BRIDGE,, available at etendi.com. 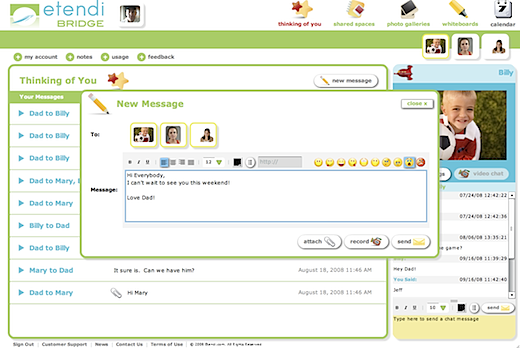 BRIDGE is a website that provides a closed environment for families to communicate without fear of outsiders and open emails. The users of BRIDGE can only write, share photos, look at a shared calendar and see video of the specific BRIDGE users in their group. This makes it perfect for kids who might be too young to have their own email. The desktop if set up for sharing photos and there’s even a shared whiteboard where you can imagine dads able to help on math homework. This is certainly not “ideal,” but changing family situations demand technology solutions, never to replace real dad time, but far better than no contact. Key for dads right now: the service is FREE for four or fewer users. So dad and up to three kids can communicate. A more extensive plan is available for larger families and more users. BRIDGE was the winner of the GreatDad Recommends program and MrDad Seal in 2009.